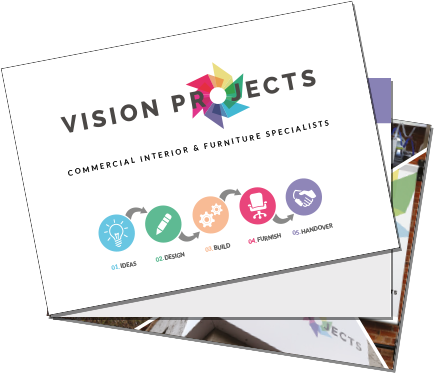 Vision Projects have 20 years of experience and knowledge to produce the highest quality office designs and planning for the perfect refurbishment and fit out. With a space that is uniquely created to your workplaces needs, Vision Projects' office design and planning goes beyond expectations. During the first stage of the design process Vision Projects will meet with the client to establish the requirements and the overall goal of the project. This will then lead to a survey of the current environment and adapting the ideal brief with the client. Throughout this first introductory stage Vision Projects will also talk to key staff members to understand the departmental relationships and cultures to produce the best possible designs to suit as many staff members as possible. Stage two involves defining the space and its use. This will also include identifying building constraints, key areas that may require special attention and establishing the whole project concept. Once all the above is completed Vision Projects will then present to the client to gain approval and begin developing the scheme. Stages 3 and 4 are some of the most exciting parts of the design process. During this phase Vision Projects develop block plans into beautiful, detailed space plans and present colour and finish ideas to bring the project to life. These designs also include the full scheme information which includes; detailed plans, finishes/sample boards, detailed elevations of key spaces and 3D visuals. Finally these stages will also be where Vision Projects ensures full compliance with building regulations and planning standards and get a final, full scheme sign-off by the client. Stage 5 of the design process allows Vision Projects to prepare all working drawings of the projects general spacing arrangements, lighting and ceiling plans, flooring and decoration as well as fire strategy and small power decisions. Once completed Vision Projects will also ensure the client has details schedules and specifications regarding furniture, flooring and fittings. Each stage of the design process is meticulous planned and completed to produce such high quality designs Vision Projects is always proud to pass over to the client.